LONDON — Yes, this will be Serena Williams’ 10th Wimbledon final. Yes, it’s her 30th title match at any major. And, well, sure, she’s widely regarded as not just the best of her era, but any era. Let others shrug at this latest accomplishment, as if all it signified were merely another chance at another in a long line of trophies. Williams is not shy about saying she, for one, is impressed by this. Rightly so. For it was only about 10 months ago she was having a baby and then dealing with a serious health scare that followed. Even after all of that, even after more than a year away from the game, even in only the fourth tournament of her comeback, Williams showed she’s still capable of dominance. Especially at the All England Club, where a relatively routine 6-2, 6-4 victory over 13th-seeded Julia Goerges of Germany on Thursday put Williams one win away from an eighth championship. She’s also closing in on her 24th Grand Slam title, which would equal Margaret Court’s all-time record. 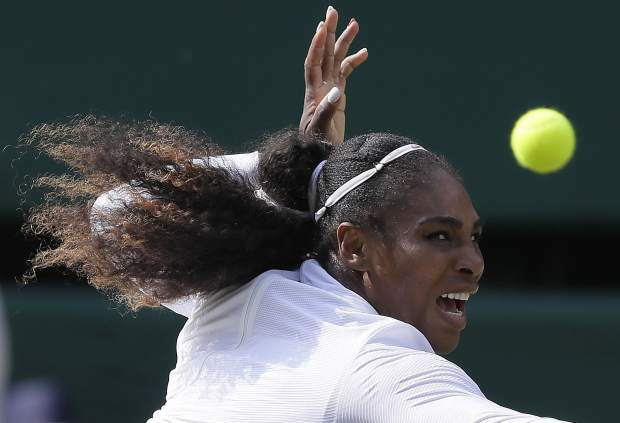 After hitting five aces with a serve that reached 119 mph, delivering 16 winners to only seven unforced errors, and covering the court so well with speed and effort, Williams will face another German, 11th-seeded Angelique Kerber, on Saturday. The left-handed Kerber, a former No. 1 and two-time major champion, beat 12th-seeded Jelena Ostapenko 6-3, 6-3 earlier Thursday. Kerber let 2017 French Open champion Ostapenko determine the outcome of nearly every point. By the end, Ostapenko had far more winners, 30-10, and far more unforced errors, 36-7. Williams vs. Kerber will be a rematch of the 2016 final. Williams won that for a second consecutive Wimbledon title, then sat out the grass-court tournament last year while pregnant, part of a 16-month gap between majors. After giving birth to daughter Olympia last September, Williams was treated for blood clots. “I lost count after, like, four surgeries,” said Williams, who has been wearing compression leggings this fortnight as a precaution. Her first Grand Slam tournament back was the French Open, where she won three matches before withdrawing last month because of an injured chest muscle. All of the time away pushed someone who’s spent more than 300 weeks ranked No. 1 down the rankings — she began Wimbledon at 181st, but was seeded 25th on account of her past success — and no one could quite be sure how the American would fare over these two weeks. The victory over Goerges extended Williams’ winning streak at Wimbledon to 20 matches, dating to the start of the 2015 edition. She’s also won her past 15 Grand Slam matches since the start of the 2017 Australian Open, which she won while pregnant. That title pushed her past Steffi Graf’s record of 22 majors in the half-century professional era; Court won some of her Slams during the amateur era. Williams’ match against Goerges was even until 2-all, 30-all. Until then, Goerges, the first seeded player Williams faced these two weeks, showed she was capable of trading power from the baseline and big serves with Williams. There were moments when watching Goerges made it easy to wonder how it could be possible she never had been past a major’s fourth round until now. Or, more to the point on this afternoon, how such a stinging serve and groundstrokes didn’t help her avoid first-round exits each of the past five years at Wimbledon. But she couldn’t keep up with Williams, who grabbed 18 of 22 points and five consecutive games to close the first set and begin the next. There was one brief blip to come: Williams got broken for the only time while serving for the match at 5-3. Immediately, though, she broke back at love to end it, placing her left fist on her chest when Goerges’ last shot landed long. Later, Williams was asked whether this has been her most trying comeback in a career that’s had its share, including an earlier bout with blood clots in her lungs.